“BLINK and you missed her,” BBC Political Correspondent Gareth Gordon said after new British Prime Minister Theresa May flew into Stormont to meet Executive leaders Arlene Foster and Martin McGuinness for just over an hour on Monday 25 July to discuss the “Brexit” referendum result which puts Britain on course to leave the European Union, possibly in two years’ time. First Minister and DUP leader Arlene Foster supports Brexit but Sinn Féin deputy First Minister Martin McGuinness has repeatedly pointed out that the people of the Six Counties – unionist and nationalist – voted to remain in the EU. Nevertheless, the overwhelming number of English votes will drag the North of Ireland and Scotland out. Prime Minister May – who took over from David Cameron a fortnight earlier – met the North’s joint ministers together and then separately before a press conference where only one journalist was allowed just one question. On the edges of possibly the shortest media event in Stormont’s recent history, Theresa May’s spin doctors were at pains to have it reported that the British Government does not want a return to a ‘hard’ Border. Only a month earlier, however, when she was Home Secretary, it was Theresa May who warned that it was “inconceivable” that border arrangements with the South would be unchanged by a Brexit vote. It was that statement that the single question allowed followed up on. The new Tory leader replied “Nobody wants to return to the borders of the past” but she danced away from the issue by talking about common travel arrangements existing between Ireland and Britain before the EU and ignoring the fact that Britain’s only land border with an EU state would be in Ireland. 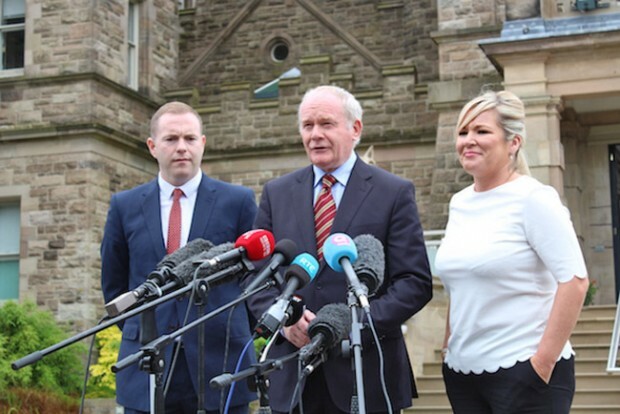 Sinn Féin’s Martin McGuinness said after meeting the British premier that he and the DUP leader are agreed on many other things such as the Fresh Start Agreement and moving forward. “I made it clear to the British Prime Minister that the democratically-expressed wishes of the people of the North who see their future in Europe and voted to remain in Europe should be respected. The Sinn Féin figure also said he raised the issue of the Border with the British Prime Minister. “I made it clear that we are totally opposed to any border of any description, whether it is for trade or the free movement of people. 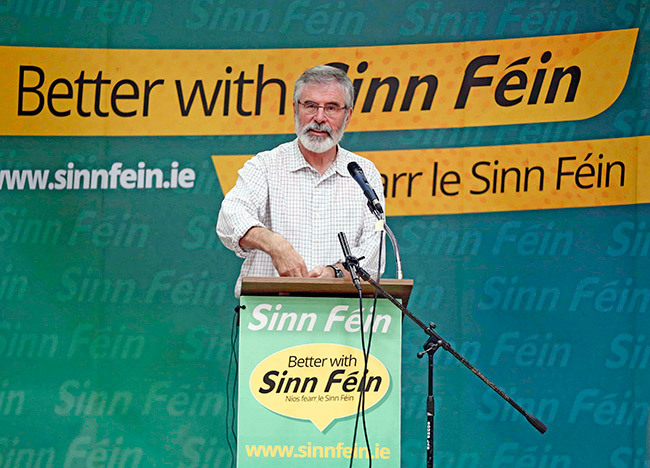 Speaking at the Dáil 24 hours before Taoiseach Enda Kenny was due to meet the British Prime Minister in London, Sinn Féin leader Gerry Adams said that Brexit has the potential to undermine the Good Friday Agreement, undermine the all-Ireland economy and undermine progress. “The imposition of Brexit on Ireland again underlines the failure of partition,” the TD for the Border county of Louth said. “There is need for all of those across Ireland who support the Good Friday Agreement, who support Irish unity and oppose Brexit, to stand together. “There is a need to redefine relationships across Ireland and to build a unity of purpose opposed to Brexit and to promote unity, democracy, and prosperity. “All of this puts a huge onus on the Taoiseach. In Scotland on the same day that Theresa May was in Ireland, First Minister Nicola Sturgeon said independence could be the best way to protect the interests of the Scottish people when Westminster sets in motion withdrawal from the EU. “I felt angry that Scotland faced the prospect of being taken out of the EU against our will – with all of the damaging consequences that would entail,” the leader of the Scottish National Party said. “The outlook for the UK is uncertainty, upheaval and unpredictability.